Do you have a supply of simple and easy to carry tracts to leave with your tip? The little two-sided card below says it all. The front side has a powerful message. The reverse side quotes the Scripture! You can personalize it by printing off some labels with your name and email address or your website on it. The labels go on easily and quickly. You can buy the labels at an office supply store. I used Staple's laser/inkjet white return address labels, compatible with Avery 5267/8167. Sure it would be nicer if a label wasn't required. And it's up to you. 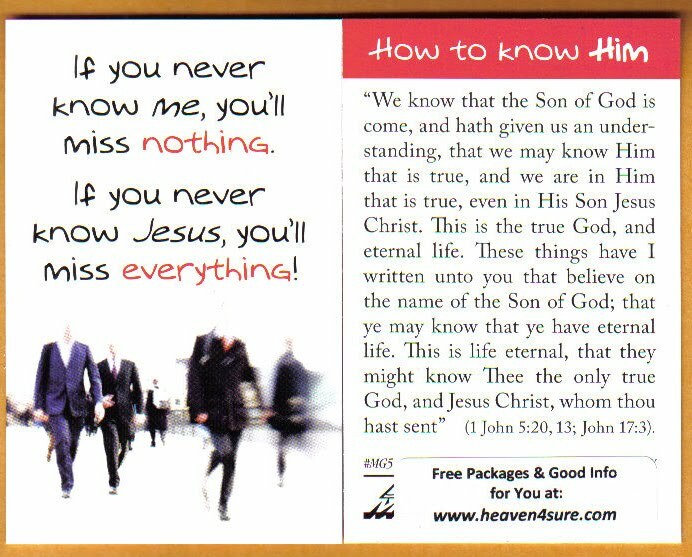 If you do not affix a label, a person could visit the website of Moments With the Book (www.mwtb.org) and they will see very decent Gospel material on that website. However, just in case the person wants to get in touch with the Christian who left the little tract - it's nice to have your own specific contact information on it. You can order your supply by clicking here. $4.50 per 100.